If an effort to support business owners in the disaster recovery process, we want to contribute with 2-Hour Complimentary business consultation, during the month of September and October 2017. We can help you with knowledge and expertise to make sound financial decisions, minimize your losses and get back to normal. Financial Management for businesses which includes review, analysis and interpretation of monthly results (financial statements) budgets, forecasts and metrics. Report will include highlights with key recommendations for increased profit & productivity. Complete Business Consultancy Click here to learn about our 4 C's approach. Individual Solutions to address specific challenges. Click here to learn more about our strategical, tactical and back-up management services. Let's work together rebuilding our city, our businesses and our lives. Contact us at (832) 998-2136, or at Soledad@SoledadTanner.com. "I did not flood! It could've been me...it could've been my house, it could've been my business. That's why we are here to help others" . We would like to thank Shailessh Mayekar, a SBA Certified Mentor that volunteers his time to help people like us! 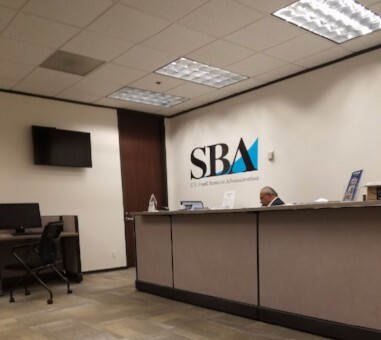 Soledad Tanner Consulting visited the SBA Recovery Center to obtain additional information on how to help our in the process of rebuilding and restoring their businesses. Below you will find a summary of key steps that will guide you on how & where to file for assistance for your business. 1) All individuals affected must register first with the Federal Emergency Management Agency to obtain a FEMA Registration ID Number online at:https://disasterloan.sba.gov/ela/Account/Register1 , or by calling 1-800-621-3362. For questions with the SBA main helpline 1-800-659-2955. 3 step process: Apply for loan, property verification & loan processing decision made, loan closed & funds disbursed. If you wish to visit the Business Recovery Center, visit a SBDC loan officer to know which loan to apply for based on individual scenarios. No appointment is needed. 3) Small business owners: "Economic Injury Disaster" (EIDL) are working capital loans to meet businesses ordinary and necessary financial obligations, that cannot be met as a direct result of the disaster. The interest rate starts at 3,305% up to a maximum of 30 years. Collateral is required for EIDL loans over $25k. This loans are restricted to only to "Uninsured Losses". We would like everyone to start the recovery process. Feel free to share this information with your business owners by clicking the links below. We are here for you! Contact us ASAP to receive your complimentary consultation. 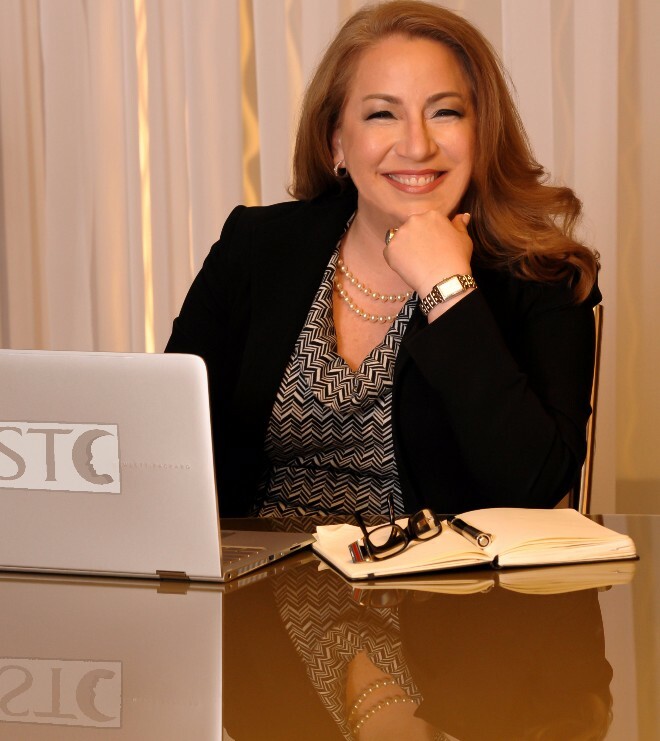 Soledad Tanner Consulting es una empresa de consultoría y asesoramiento financiero. Ayudamos a negocios a incrementar la utilidad y optimizar su empresa: analizamos e interpretamos los resultados financieros, elaboramos presupuestos tanto operativos, financieros y de venta. Su negocio puede llegar a ser tan bueno como era antes y mejor. Aproveche esta oportunidad que estamos ofreciendo durante el mes de Septiembre y Octubre 2 horas complementarias de consultoria. Aquí estamos para ayudarlo! Contactenos a: 832-998-2136, Email: Soledad@SoledadTanner.com. Que hacer si su negocio sufrio danos y perdidas a causa del Hurancan Harvey? Revisen sus pólizas de seguro (tienen Seguro de interrupción de negocios? 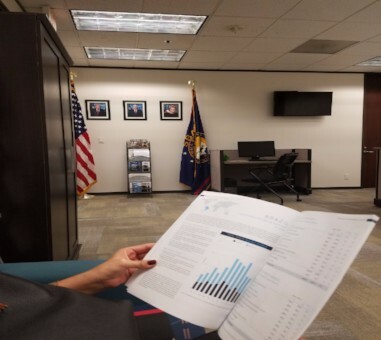 ), aplique a FEMA, aplique a prestamos a travez de SBA – Small Business Administration (bajo interés hasta 2 millones de dolares y hasta 30 anios plazo). 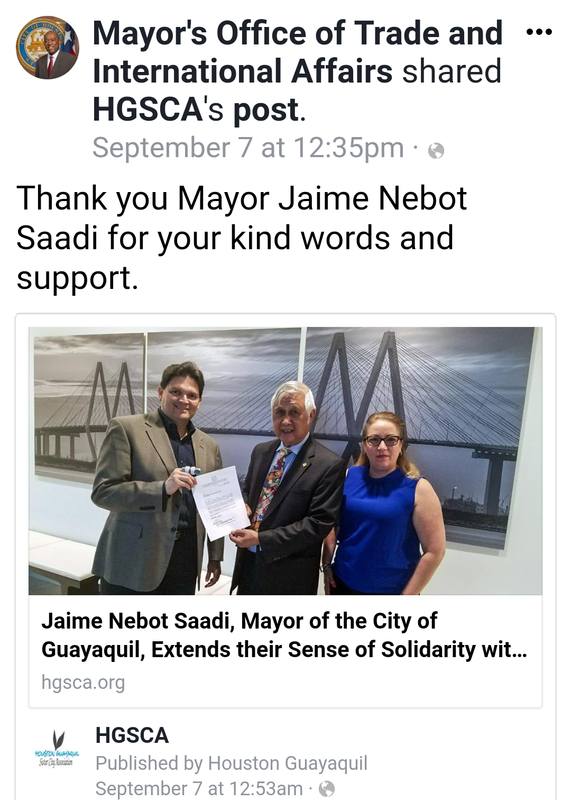 Jaime Nebot Saadi, Mayor of the City of Guayaquil, extended their sense of solidarity with the American people and, in particular, with the State of Texas and the City of Houston, which is a Sister City of Guayaquil, for the devastation caused by Hurricane Harvey. Houston Guayaquil Sister City Association, represented by Luis Moyano and Soledad Tanner, President and Vice-President of the organization, handed the letter of solidarity over to Mr. Harry Gee, President of Sister Cities of Houston, who will deliver, in person, the letter to Mayor Turner. Along with the letter a $500 donation will also be made to the Harvey Relief Fund established by Mayor Turner. Guayaquil maintains a close bond of cooperation and fraternity with the city of Houston, through its Sister Cities Program, manifested through the aid received by Ecuador for the victims of the earthquake that occurred on April 16, 2016. As a token of appreciation and support, The Very Illustrious Municipality of Guayaquil has included the Red Cross link http://www.redcross.org/cruz-roja in its official web page and social networks to redirect through its institution any possible donations to the victims of hurricane Harvey. Guayaquil is Ecuador’s largest city; it is also the country’s leading port, an economic powerhouse, a growing tourism destination and a model for sustainable urban development. Under the leadership of its forward-thinking Mayor, Jaime Nebot Saadi, who came to office in 2000, the city has made spectacular progress over the last two decades and now ranks as one of Latin America’s rising stars. Mayor of Houston, Sylvester Turner, acknowledges Mayor of Guayaquil, Jaime Nebot's words of encouragement toward Houston due to the devastation caused by Hurricane Harvey. On behalf of Soledad Tanner Consulting, we want you to know that our hearts and thoughts are with all of you after the devastating storm. We have all been affected by Hurricane Harvey, and many of you are facing great losses. We would like to inform you how to get help in the process of rebuilding and restoring our lives. We are presenting you with a summary of key information that will guide you on how & where to file for assistance for your business. In an effort to support business owners in the disaster recovery process, we want to contribute with 2-Hour Complimentary business consultation, during the month of September and October 2017. We offer you STRATEGIC MANAGEMENT SOLUTIONS so you can make wise financial decisions, minimize your losses and get back to normal. Let's work together rebuilding our city, our businesses and our lives. Contact us at 832.998.2136. The President of the United States Federally declared 18 Texas counties as a disaster area (TX-00487, signed on August 25th, 2017). FEMA assistance comes in the form of grants, which do not need to be paid back. The SBA (Small Business Administration) has coordinated with FEMA affordable disaster low-interest loans to those affected by Hurricane Harvey. Funds are available for those with business, property and personal loses. For additional information click on the following links to apply, or call customer service 1800-659-2955. 2. FEMA flood claims process: advance payments, proof of lost waiver & grace period extension. 4 Types of Loans: Business Physical Disaster Loans, Economic Injury Disaster Loans (EIDL), Home & Personal Property Loans, Military Reservists Economic Injury Loans. Credit Requirements: Credit history, repayment, collateral. Facts of how to file with the U.S. Small Business Administration. IRS: Hurricane Harvey victims in parts of Texas have until Jan. 31, 2018 to file certain individual and business tax returns and make certain tax payments (previous deadline was for Sept. 15). TEXAS SMALL BUSINESS DEVELOPMENT CENTERS (SBDC's) to receive assistance for small business impacted by the disaster.